Tour ScheduleFind the tour for you. Arrive Geneva Airport (see below for best arrival times). Met by our minibuses and taken to our start town of Magève (transfer time 70 minutes). Plenty of time to make bikes up and to enjoy the town. You’ll be provided with a hearty dinner followed by an informal briefing to discuss the riding over the coming days. Megève to Bourg St Maurice (Bellentre). A very pretty way to start our journey as we head up our first challenge the Col des Saisies. 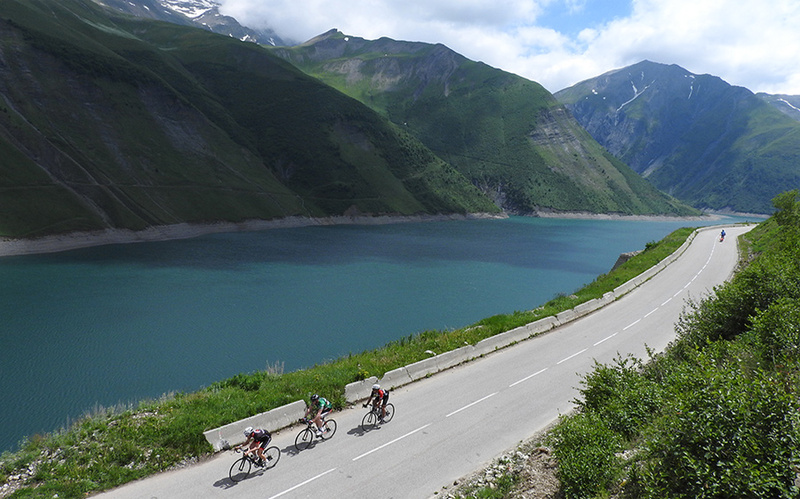 After a descent to Beaufort will head up the beautiful Cormet de Roselend with the option of the Col du Pré too for those looking for maximum challenge on day 1! Bourg St Maurice (Bellentre) to Aussois. Today starts with the long climb of the Col de L’Iseran, the highest paved pass in the Alps. The spectacular last few kilometres will help numb the pain of this 2770m giant. The descent down the other side into the upper Maurienne Valley is stunning. We’ll make our way up to the pretty village of Aussois to complete our day with the option of the Col du Mont Cenis for whoever needs more! Col du Télégraphe will provide us with the perfect warm up to the classic Col du Galibier that follows almost immediately after it. After scaling the Galibier and enjoying some time at the summit we’ll make the technical descent to the Col du Lauteret followed by the super fast, sweeping road down to Briançon. That might be enough for some but for those looking for extra challenge the gorgeous Col du Granon awaits us as does the Col de l’Echelle on the Italian border. Col d’Izoard will be our first climb of the day followed by a long descent to Guillestre. The second part of our ride will take us over the Col du Vars followed by the descent into the remote Ubaye valley. As usual there will be extra options to this route with sorties up the Col de la Larche and the ski station of Pra Loup actively encouraged! Staying 2 nights in Barcelonette gives us lots of flexibility on this day to design what each rider needs. Surrounded by fabulous bike riding each rider will be able to choose a day to either challenge or perhaps recuperate a little. For stronger feeling riders the Col d’Allos, Col des Champs, Col de Cayolle loop might appeal, a spectacular and big day at 118kms and over 3000m climbing. Allos and Cayolle also provide beautiful ‘up and back’ rides returning to Barcelonette for those looking for a shorter day. Our big objective today is the Cime de la Bonette. The highest paved road in the Alps at 2802m. Just outdoing the Col d’Iseran by a few metres by virtue of an extra loop of tarmac that extends upwards from the Col de Restefond. The 24km climb to the top will be followed by an epic descent into the Tinéé valley and onwards towards Nice and the Cote d’Azur. Our final day will be a wonderful route taking in many of the classic rides around the Nice area and much used by the pro riders who live and train in the area. There is lots of flexibility on this day to adapt the route but likely inclusions will be Col de Turini and Col d’Eze before heading along the coast via the Promenade des Anglais in Nice and on to our final night stop in beautiful Antibes. 8 nights of accommodation, twin share, in a combination of gites and 2/3 star hotels. Who will enjoy this trip? This trip is long and challenging but offers more flexibility in each day in it’s route choice than, for example, our Grand Tour du Sud trip. As a result of this flexibility this trip will be a great experience to a range of rider levels. Riders will ride between 650km and 900km on this journey depending on the daily options chosen and the total amount of climbing will be between 13000m and 20000m. The main prerequisite for the trip is being prepared and happy to ride 5-6 hours each day. We would anticipate most riders on this trip having already ridden in high mountains before, but not always. As is always the case please contact us to find out more as to whether this trip will be suited to you. Flights into Geneva on Saturday June 15 or June 29 should ideally land before 1400 with a view to leaving the airport at around 1500. Later arrivals can usually be accommodated but please contact us before making any flight bookings so that we can confirm their suitability for convenient pick ups. Departure from Nice on Sunday June 23 or July 7 is flexible. Our hotel is close to the airport and homeward flights can be booked at any time of the day.